Think you have the bombest sneakers around? Next to these sneakers by junk-metal artist Gabriel Dishaw, your crazy, neon high-tops don’t even compare. Dishaw creates detailed shoe replicas out of metal and electronic scraps, using only glue and bending techniques to hold them together. So far, he’s created five shoe sculptures inspired by some of his favorite kicks, and although you probably wouldn’t want to wear them, they’re the ultimate statement shoe. 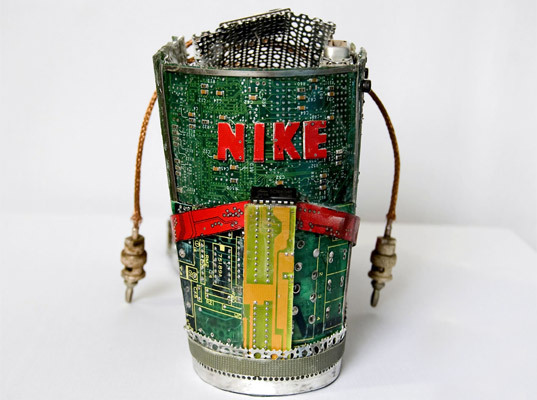 Dishaw takes found pieces of useless metal to create something everyone can relate to. Think you have the bombest sneakers around? Next to these sneakers by junk-metal artist Gabriel Dishaw, your crazy, neon high-tops don't even compare. Dishaw creates detailed shoe replicas out of metal and electronic scraps, using only glue and bending techniques to hold them together. So far, he's created five shoe sculptures inspired by some of his favorite kicks, and although you probably wouldn't want to wear them, they're the ultimate statement shoe.